The discovery of humpback whale songs opened hearts and minds, and heralded the modern conservation movement. 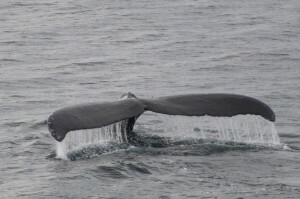 Humpback whales produce other remarkable social sounds including screams, whistles and grunts. They can also produce aerial trumpets, percussive impact and loud feeding calls when pursuing schools of Pacific herring. The Juneau Lighthouse Association has teamed up with Alaska Whale Foundation researchers Dr. Fred Sharpe and Michelle Fournet to better understand the role of these sounds in the life of the humpback whale. With its commanding vistas and abundant whales, Five Finger Lighthouse is an ideal location to study the function of these vocalizations, and how they might be impacted by human activities that create underwater noise. The first phase of our research has been to classify the underwater sounds humpback whales produce (Fournet et al 2015) and document the social and environmental context of the calls . This provides insight into the function of each sound, which may include pod formation, dispersal, aggression and/or cooperative hunting. The next step is to play the sounds back to whales with an underwater speaker to see if this elicits an approach or other predicted behaviors. The final step is to compare our findings with humpback researchers on other global breeding and feeding areas. This helps determine which calls are universally prevalent and most likely linked with essential behaviors such as birthing, nursing, mate selection, finding food and avoiding predators. By understanding the function of their calls, perhaps we can lure or dissuade whales away from dangerous situations such as oil spills, seismic exploration or military defense training. Learning about humpback whales also fosters an appreciation of these magnificent beings and helps direct us towards a future where whales and humans can safely coexist.